Greetings everyone and welcome to our site. Our focus is going to be on shower heads. Choosing the best shower head is no mean task, especially with so many types available in the market. handheld shower on a long and flexible hose. However, that is not the main distinctive feature of this product. What draws the eye the most is its a unique octo-shaped rain showerhead. This deluxe feature will take your showering experience to the next level. The rainfall massaging head will let you enjoy your shower like never before. The Octo 6 Shower System from Zoe Industries is made of high-quality materials only such as heavy-duty stainless steel. 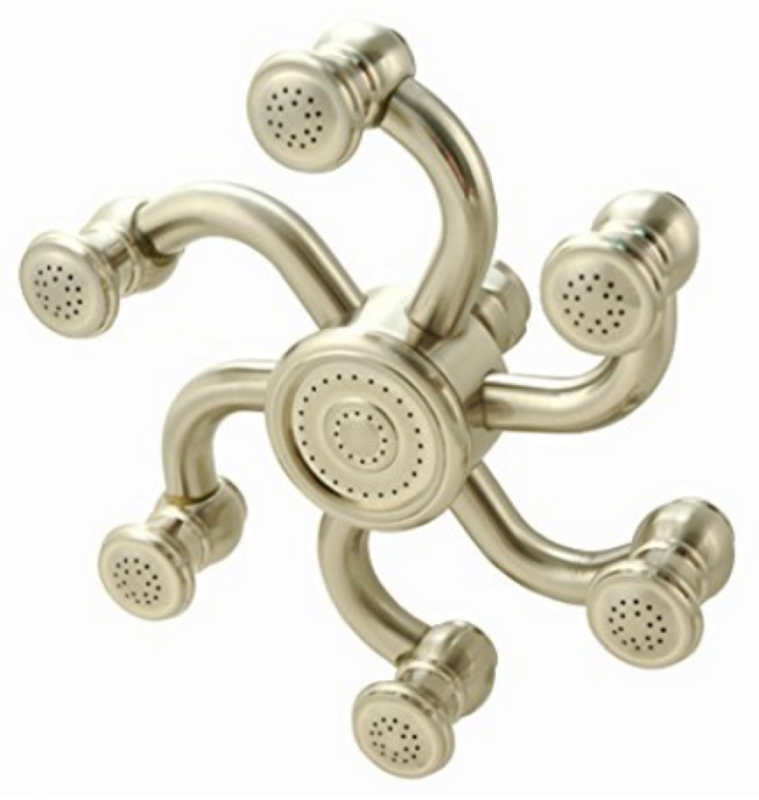 The faceplate of the octo rain shower head has a center spray surrounded by six spray arm. The overall number of spray nozzles is 144. It is attached to a 13-inch shower arm to increase the showering space. It can be installed with the help of a plastic suction cup or a screw mount wall bracket. The latter option is more reliable; however the suction cup is also rather durable. The octopus shape is rather popular this year. This is another octo-shaped showerhead. However, unlike the previous product, this is a single showerhead without any extras like a shower arm or a handheld showerhead on a hose. Its shape is slightly different compared to the previous model. Its spray arms are straight, not bent downwards. Its faceplate includes a centerpiece and six spray arms going outwards. Its 144 spray jets will offer a full body coverage for a relaxing showering experience. The Octopus Shower Head from Neatitems has a solid brass construction that ensures quality and durability for many years of use. It comes in a versatile stylish finish color that will match most bathroom decors. This showerhead has a 2.5 gallons per minute water flow rate. Its construction includes a built-in flow restrictor that can be removed any time if you find that water flow insufficient. This showerhead is designed to fit standard ½ shower pipes. twelve spray arms. Such a design makes this showerhead look like a captain’s wheel. The showerhead has 72 high pressure spray nozzles that offer a powerful spray even in households with the low water flow issue. It is made of high-quality solid brass with a glossy polished chrome finish. It comes with a standard WaterSense approved water pressure – 2.5 gallons per minute. It is not strong enough to offer unpleasant sensations on your skin, yet it is powerful enough to rinse shower gel and shampoo off your body and hair. The showerhead is complemented with a shower arm and flange made of the same material and coming in the same finish color. The construction of the showerhead includes a ball joint to offer full coverage each time you take a shower. Rain, or rainfall showerheads have a wide faceplate – six to twelve inches in diameter. The faceplate has multiple nozzles each of which offers a powerful spray. Rain showerheads offer more coverage compared to other types. If you want a full-body showering experience, a rainfall showerhead is just the thing for you. In this category, the Moen Rainfall shower obviously stands out. This 8-inch velocity shower head lets you personalize your showering experience. By a mere flick of a lever, you get to concentrate the flow of water to as little as 30 nozzles or even expand it so that it flows at 100 nozzles to get that calming rain rinse. With a spray head diameter of 8 inches, it is able to deliver optimum water flow of around 2.5 gpm (gallons per minute). What Makes Moen Different? Moen sets the pace for innovative design, exceptional beauty and reliability. Also, it comes with a Limited Warranty that covers drips, leaks and finish defects. While handheld showerheads enjoy remarkable popularity in African and Asian countries, they are not as popular in the West. The reason for this may be that water pressure in Western countries is better which means you don’t necessarily have to hang a shower over you to have your body sufficiently covered with water. But you cannot deny the fact that they offer more flexibility compared to traditional showerheads. Not only is this type of shower head great for kids but also for people who enjoy splashing the water around. Handheld showerheads, unlike the other types, do not get fixed to the shower arm on the ceiling or the wall of the shower. Instead, they come with a handle that allows taking them in your hand and directing the stream wherever you like. If you want to take a shower without having to strain and bend in unnatural angles to get the water on your back, legs, and other parts of the body. They are also a great option for households with a low water pressure. Taking the showerhead closer to your body can help with that. In this category, we recommend Ana Bath. With Ana Bath Combo Shower System, you have the easiest method of upgrading your shower system without necessarily using any tool. You won’t require any power drills or screwdrivers – just your bare hands. With this type of shower head, you get a remarkable shower experience and an innovative water saving technology, which will reduce your water bill. This cool shower head comes with several spray patterns: bubbling spray, massage spray, saturating spray, saturating and massage spray, and saturating and bubble spray. It has a 2.31 gpm flow rate, 80 psi and 8.73 LPM (liter per minute). With this customer-recognized shower, showering in the morning does not have to be a routine but something you look forward to every day. 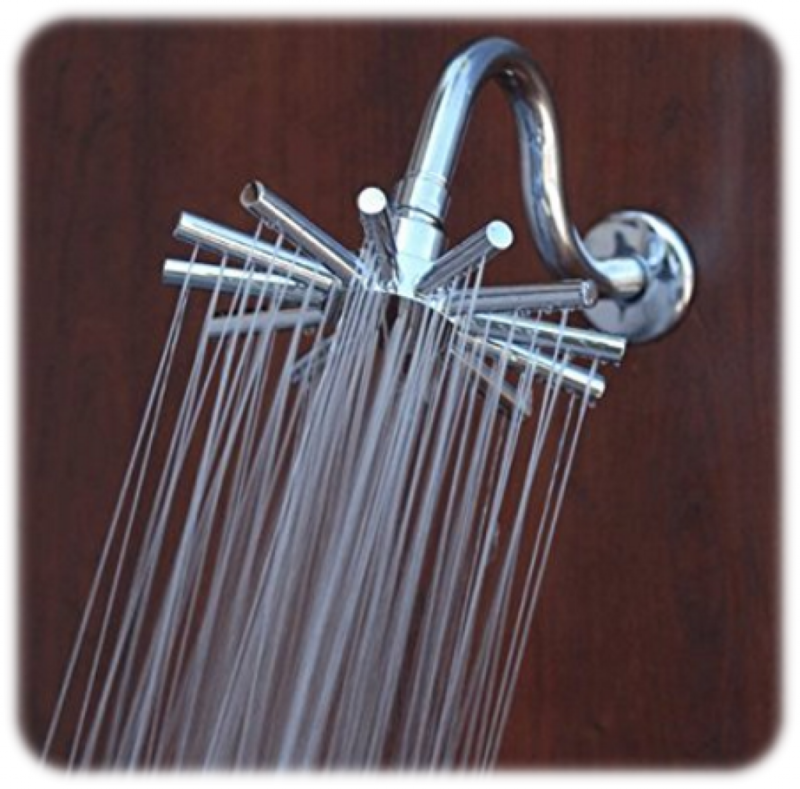 This type of shower head is a great option, especially if it is meant to serve two people. It differs from dual showerheads in that the shower heads are separate and not joined together like in a dual shower head. The benefit of this type of shower head is that it can comfortably serve two people at the same time. 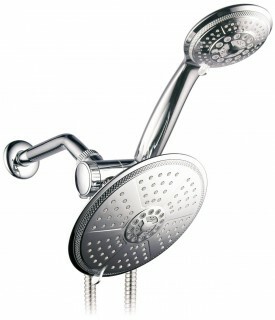 Dual showerheads combine two types of showerheads. Usually, it is a rain showerhead and a handheld showerhead. However, there are possible variations – two rain showerheads, and others. Their main pro is that they combine the advantages of two types of showerhead, meaning they can offer a more diverse showering experience. In this category, we have found HotelSPA – Rainfall/Hand Held Shower Combo as the best. While it is a tad bit more expensive compared to the common offerings, its quality is great, especially if you consider the amount of money you pay for it. Although it is 90 percent chromed plastic, it is of fairly sturdy built. It has the appearance of an expensive and high-quality unit. It has a metallic hose and it’s just as flexible as indicated by the manufacturer. Its hose fitting, fitting on the back as well as the ball joint on main shower head are all metallic. The rest of the fittings, which also include the hub/connector and the handheld piece, are plastic. 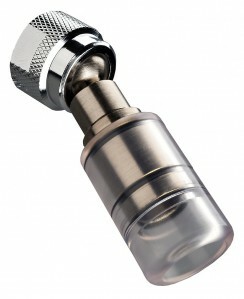 The package includes Teflon thread tape that helps to attach the showerhead to the main pipe. You won’t, therefore, have to buy it separately. In the instructions, they mention that you shouldn’t use thread tape on any fittings. They also warn you about using any tool for assembling it. A shower is assumed to be a more water-saving method to wash compared to taking a bath. However, this is not always the case. If you want to save on your water bill, you need power saving shower heads. Being ecologically aware has become a priority for many people. This trend has been brought into the bathroom, too. Today, there are many plumbing fixtures that allow saving water. Low flow showerheads are among them. They come with a built-in restrictor that decreases the water flow. The less water comes out of the showerhead in one minute, the more of it is saved. The highest water flow that is allowed by WaterSense standards is 2.5 gallons per minute. Low flow showerheads are designed to offer less than that – 2.0, 1.85, 1,5, 1.0, and even 0.5 gallons per minute. If you believe that less is more, a low flow showerhead is a wonderful choice for your bathroom. These shower heads are designed in such a way that they save water for you. You will, in turn, save a lot of money on your monthly water bills. This is the main advantage with water-saving shower heads. The best product in this category, according to customer reviews, is the High Sierra. This awesome shower head is the newest as well as the most inventive high efficiency shower head you can find in the market. The technology used here creates a spray which acts like a higher flowing showerhead while saving you potentially hundreds of bucks every year in energy and water. It is constructed using solid metal and has a polished chrome finish. Its new crystal clear ABA splash guard leads to a perfect spray diameter. It is available in colors to complement any décor.With High Sierra 1.5 gpm High Efficiency Low Flow Showerhead, you will be able to save 50 dollars per person per year on the cost of heating water. Also, you will save 1700 gallons of per person per year as opposed to when you use 2.5 gpm showerheads. It is not always that people live in a house or condo with an excellent pump that guarantees high pressure in the taps. You may be living in a place which only has dribbles. Even if the water pressure is ok, you may still want water coming in jets. If that is the case, you may consider investing in high pressure showerheads. Just as the name suggests, these showerheads deliver water at very high pressure. High pressure showerheads can offer an increased amount of water flow even in the houses with the lowest water pressure in the pipes. With such a showerhead you will also get an added advantage of saving water, which is great news for those who care about the environment or want to save some money on the water bills. Our pick in this category is Speakman. This Icon Anystream 6-jet showerhead is basically the last showerhead you will ever need. It features a solid construction of durable solid glass which ensures quality and longevity. Each unit embraces traditional and timeless design with technological updates which will completely change how you view your shower. Infinitely Adjustable showerhead. 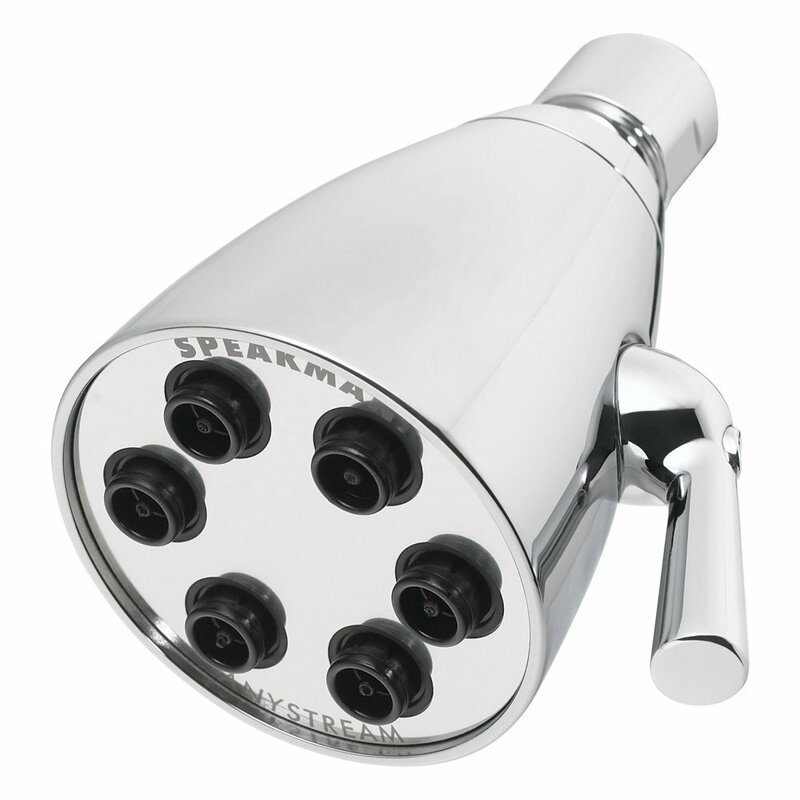 Designed to please just about any bathing preference, this Speakman adjustable showerhead features Anystream technology which enables it to be highly versatile. You only need to rotate the lever and be able to adjust it to any direction and seamless transit to any versatile pattern.With the intense spray setting, you can get massaged and even become immersed in its soaking Drench pattern. Alternatively, you can use Full spray setting to get fully absorbed. Less Setup Time, which essentially means more shower time. It is very easy to install your Icon Anystream. The manner in which it was designed was to facilitate easy installation into your showerhead in just a matter of minutes. You just have to twist off the existing showerhead, roll on included plumber’s tape, twist the Icon showerhead on and you are good to go. However, flange and shower arm are not part of the deal. You may have already realized that not all showerheads can be used by kids. Kid’s showerheads are designed for use by children and there is a huge variety of them available in the market. 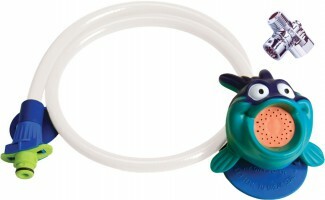 Some have funniest and cutest shower hoses as well as shower heads and can be very apt for your kids. Kids showerheads produce a gentle stream that is safe for kids and will not irritate their sensitive skin. Such showerheads also have an educational purpose as they teach children how to shower without the help of parents. Some models can be adjusted to support kids as they grow. If you want to teach your children how to shower, a kids showerhead will help you with that. Among the bestselling showerheads in the category of kid’s showerheads is Rinse Ace. 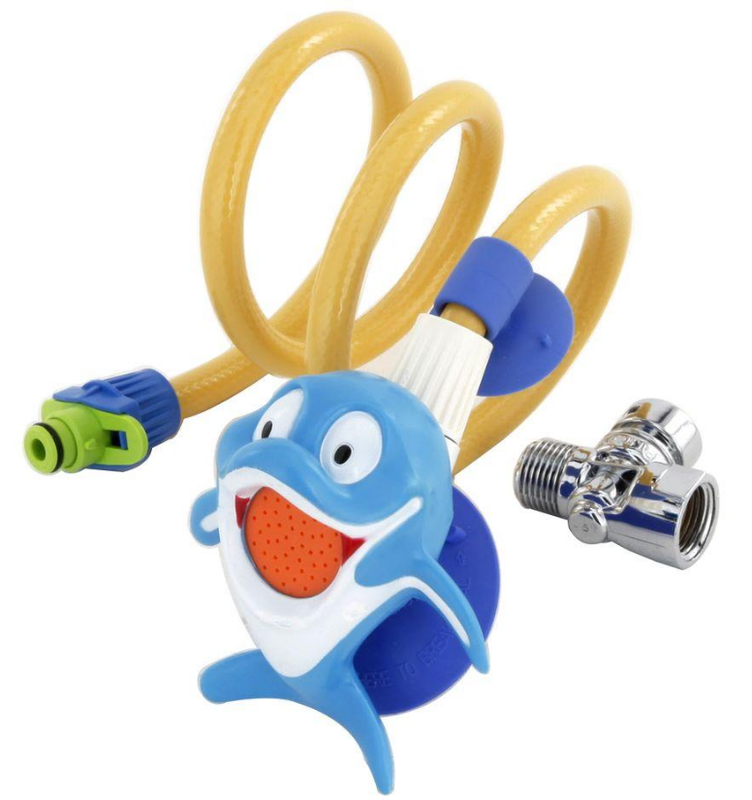 It features a cute head and hose and is just the perfect gadget to make your young ones like their bathroom sessions. Designed with the kids in mind, this Rinse Ace My Own Shower Children’s showerhead makes shower time not only safe but also complete fun. It is meant to cater for both safety and comfort of your child. Snap on its 3-foot hose, place the showerhead, and the water will flow gently at your child’s height. After use, you can disconnect it. These types of unique shower heads basically convert your bathroom into a discotheque. It is especially a great idea for someone who wants to bamboozle their ladies. 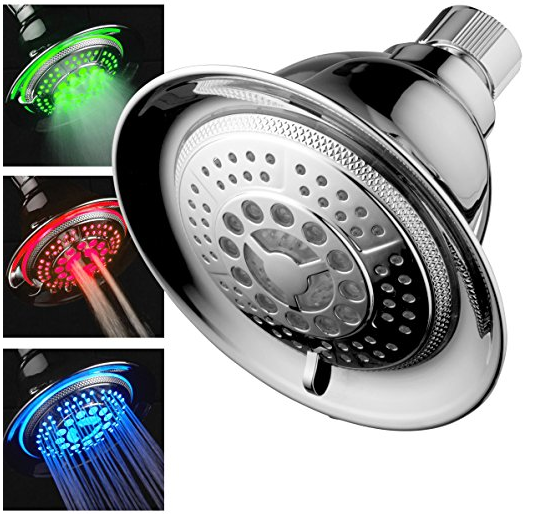 LED showerheads, as the name suggests, come with built-in LEDs that produce colored lights when you are showering. The Led lights are powered by the turbines that work on the energy of water. 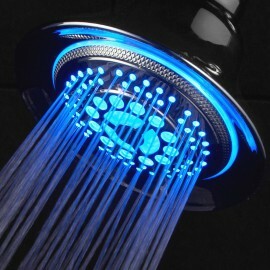 Most LED showerheads produce light of two colors – blue when the water is cold and red when the water is hot. Such models come with sensors that react to the water temperature. However, some models can offer a larger variety of colors, turning your shower cubicle in a disco hall. LED showerheads will be an excellent choice for those who like light effects and want to create a special atmosphere in the bathroom. The best thing about this type of showerhead is that, unlike traditional lights, it does not generate heat. Also, they are very durable and will last years before you change the globe. The Editor’s pick in this category is DreamSpa® Shower Head that is hugely recognized by customers. 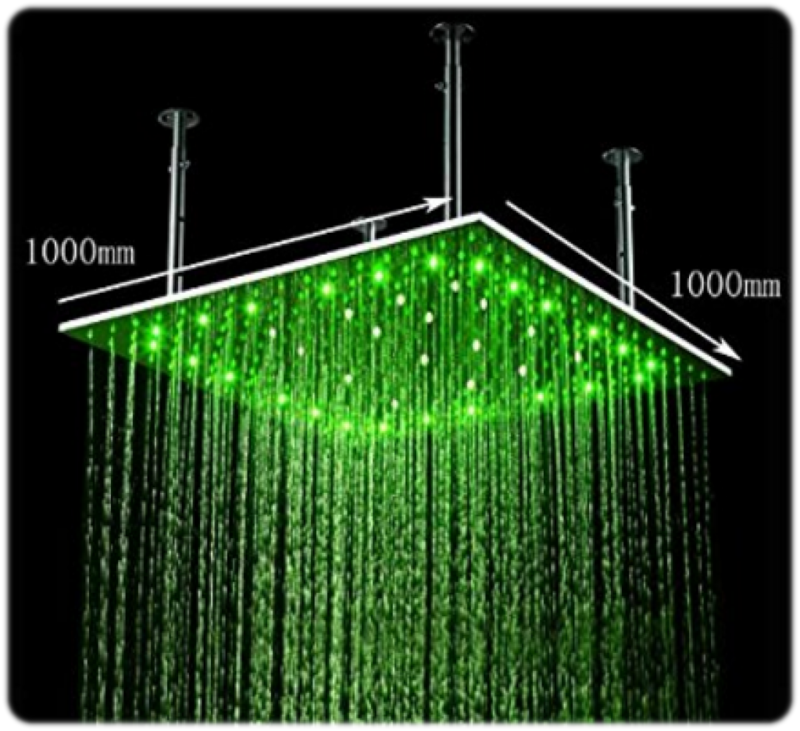 This is a luxurious hand light emitting diode (LED) shower that automatically changes color according to the temperature of water and is powered the by running water. It features a high-power three-zone dial, chrome face and five settings. Make your showering experience bright with the top-of-the-range LED light hand shower. Apart from the 3-color-altering water sensors, it comes with 5 pressure settings to guarantee maximum comfort. Do you think that you have best shower system? You need to think again. I bet you haven’t seen this shower head that has a speaker to let you enjoy your favorite song even as you bathe. With these types of speakers, you no longer have to rely on your phone for music as you take a shower. They have AM/FM radio as well as full-blown Bluetooth connectivity. There are even some others that come with Wi-Fi to enable you to connect and even play music right from your laptop. If you cannot imagine taking a shower without humming your favorite songs, then, a Bluetooth showerhead is just the thing for you. Such showerheads come with built-in speakers that can connect to your smartphone, tablet, or notebook – any gadget that supports Bluetooth. Bluetooth showerheads and speakers can play the music and allow you to answer calls while showering. They come with rechargeable batteries that can offer up to 15 hours of music, some even more. The best models can offer crystal clear sound and a user-friendly control panel. With a Bluetooth showerhead, you’ll be able to sing along with your favorite band. 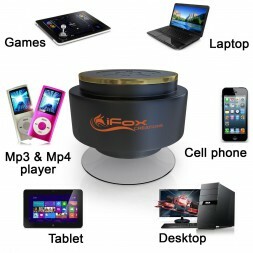 Next time you go shopping for a Bluetooth showerhead speaker, make sure you pay attention to Bluetooth Shower Speaker by iFox Creations. It is a compact speaker with quite an amazing sound. The rugged, water-resistant speaker will go with you wherever you go and it’s just as tough as it is powerful. It features an in-built microphone to allow for hands-free phone calls as well as a technology that enables it to float in water. Simply put, this showerhead is perfect for use not only indoors but also outdoor pools and showers. Luxury showerheads are designed for those who are used to having the best of the best. They combine the advantages of different types of showerheads. Luxury showerheads can offer high water pressure, built-in LED lights, massage jets, waterfall or rainfall effect, and more. 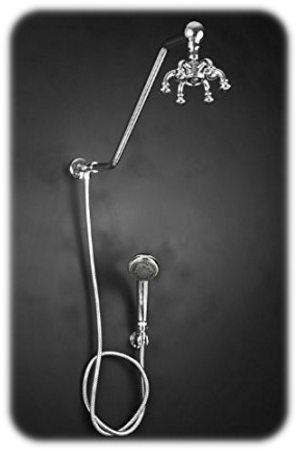 Most luxury showerheads come with unusually wide faceplates, some of them as huge as 40 x 40 inches. If you are prepared to pay a few extra hundreds for the utmost comfort and the highest quality, a luxury showerhead is just what you need. It will upgrade your whole bathroom and make it look more expensive and luxurious. 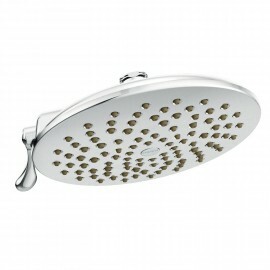 In this category, we recommend this large showerhead from Cascada. If you have dogs, then you probably know what a nightmare it is to give them a wash. Getting them into the bathtub is just the beginning. The most interesting part starts after that, when you have to shampoo them and then rinse all the lather from the fur. Dog showerheads can help you with this difficult task. They are constructed to make showering as comfortable as possible both for you and for your pet. They come with a low hose so that you can direct the spray where needed and give your dog a thorough wash. Some showerheads for dogs have a special protector to make sure that the water does not get into your pet’s eyes and ears. Such a showerhead is a necessity for those who care about their pets. 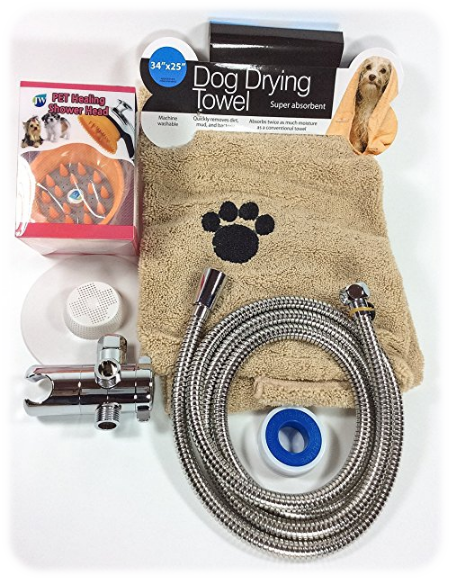 For those who are looking for a showerhead for their pet, we suggest checking out this set from Homescape World. microfiber towel, which are nice extras. Made of medical grade silicone, which makes it safe for the health of your pet. It comes with a hood with small teeth to clean the dirt and massage the skin. The hood can be removed for washing long-haired dogs. It comes with an on/off switch for the control of the water flow when giving your pet a wash.
What is the Best Shower Head Brand? Brands producing showerheads are multiple. 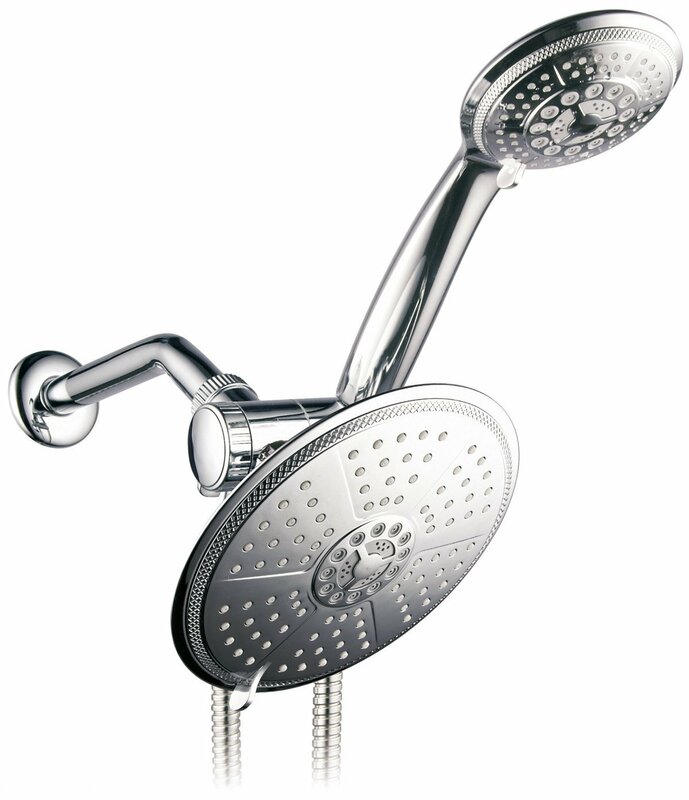 Each of them specializes in some specific types of showerheads, and each has some distinct features. However, not all of them offer products of a superior quality. We have selected only the top brands producing showerheads for you. American Standard is the leading manufacturer of bathroom fixtures in the USA. Their reputation has been backed by 140 years of innovations and high-quality products. American Standard is a great choice for true patriots. This brand makes a special accent on wellness, sustainability, safety, and beautiful performance. While caring about the design, their main accent is on the functionality and practicality. American Standard produces the best rain and handheld showerheads. Their models come with the patented EasyClean technology. The faceplate has a special covering so that you can clean it just by wiping it with your finger after taking a shower. Moen pays special attention to design. So, if you care about looks, you can choose one of their models. They can offer a wide line of showerheads characterized by unparalleled beauty, innovation, reliability, and premium design. Products of this brand will be a nice choice for those who care about looks yet do not want to sacrifice the quality. Most showerheads from Moen can offer several spray patterns for a diverse showering experience. A self-pressurized spray and a calming and soothing rinse function are just some of the options available. 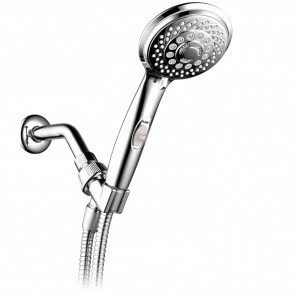 Moen produces top-quality rain showerheads with the unique Immersion Rainshower technology that magnifies the natural force of water to offer a revitalizing full-body shower. Delta is another premium bathroom and kitchen fixtures brand that specialized on producing showerheads. They have been on the market for almost a century now. Delta offers showerheads of various types – water-amplifying, rain, two-in-one, handheld, massage, and more. Showerheads from Delta will add some novelty for those who are tired of a monotonous showering experience. Showerheads from Delta are an excellent choice for those who are looking for a diverse showering experience. They come with a great number of spray functions including fast massage, slow massage, full massage, full spray, fine spray, champagne spray, energy-saving spray, and pause feature. Delta Faucet company is fascinated by water and makes its best to offer us the highest comfort in the shower. Kohler is also among the best well-reputed showerhead brands today. They produce showerheads with a modern design and high-tech features. You can find luxury and affordable models among Kohler produce. Their produce is for those who appreciate quality and innovations. The main accent of Kohler is on making rain showerheads. They come in different shapes – bell, flat, round, square, and more. The brand also cares about the ecology by creating low-flow water-saving showerheads. Kohler’s line of showerheads also includes models with built-in Bluetooth speakers that can wirelessly connect to your gadget and play music while you are showering. Grohe is one of the oldest brands producing bathroom fixtures. It is a German company, that, just like everything German, stands out for the reliability and highest quality. This brand is for those customers who respect time-proven technologies. Showerheads from Grohe are admired by users thanks to their distinct design, sturdy construction, and multiple handy features. They are characterized by versatility and a great number of spray settings. Most showerheads by Grohe offer six types of spray – Normal, Rain, Jet, Pure, Champagne, and Massage Sprays. They come with rubber spray nozzles that are guaranteed never to clog and offer easy cleaning. Simple showerheads can offer only one spray function. However, that is quite boring. With time, you will wish to have a more diverse showering experience. That is why the majority of modern showerheads come with multiple spray patterns. Let’s have a closer look at the most common ones. Regular Spray. This is the standard spray that most showerheads can offer. This is the basic spray pattern. 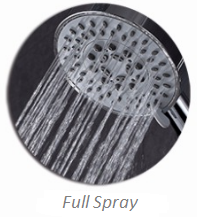 Those showerheads that come with just one water function provide this very spray pattern. Massage Spray. This is a real lifesaver for those who want to experience all the benefits of water massage. It will help you relax all of your sore muscles after a hard day at work before you go to sleep. Rain Spray. 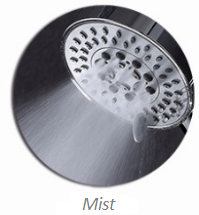 This type of spray is common for rain showerheads that come with a large faceplate. Soft and delicate, it will gently pat your skin, washing away all the worries of the day behind. Mist Spray. This spray lets out the water in tiny drops that spread all over your skin giving you pleasant prickling sensations. The fine droplets are so small that they actually look and feel like mist. Pause Spray. This feature is designed to aid water saving. You can switch to Pause when lathering your body or shampooing your hair. This will help you decrease the amount of water you use when showering. Full Body Spray. This spray pattern forces the water out of all the nozzles on the faceplate of the showerhead. As a result, you get a full-body showering experience with maximum coverage. Jet Spray. This is a powerful spray that offers a refreshing burst of water coming out of the center of the showerhead. It is great for rinsing shampoo out of your hair, as well as for soothing muscle pains. Champagne Spray. This spray is enriched with air to achieve larger and softer droplets that resemble champagne bubbles. Adding air to the stream means less water is needed for a fulfilling showering experience. Aeration Spray. With this spray, you will get a mild stream of water. Such an effect is achieved thanks to the air inserted into the water. Apart from being gentle on the skin, aeration spray can help you conserve water. Which is better – bath or shower? It seems, there are two camps – bath lovers and shower lovers. Both methods have their advantages when it comes to health benefits, comfort, cost-efficiency, and eco-friendliness. You can find a detailed answer to this question in our article. Which type of showerheads is the best? It depends on your needs. If you want a full coverage, you should opt for a rain showerhead with a large faceplate. If you want high flexibility in the shower, you should try a handheld showerhead; with it, you will be able to direct the spray wherever you need. If you want to increase water pressure in the shower, you should have a closer look at high-pressure showerheads. If you interested in water conservation, consider purchasing a low flow showerhead. If you want to bring music into your showering routine, installing a Bluetooth showerhead will be a perfect solution. Luxury showerheads are a great option for those who want to have all the benefits combined. How long should a shower last? According to HomeWaterWorks, an average shower lasts 8.2 minutes. Yet, again, it should depend on your personal preferences. If you like long and hot shower sessions, then go for it. If a cool shower quickie is your thing, that’s fine. However, you should remember that the longer your shower is, the more water will be wasted. Remember that the main purpose of showering is to get clean. If you take daily showers, it is unlikely that you will need more than five minutes to wash off all the sweat and dirt. A shower timer will help you reduce your showering time. Cold or hot shower – which is more beneficial? Both cold and hot shower have their health benefits. The choice should depend on your needs. If you want to wake up, increase alertness, and free the mind, you should go for cold. Fortified immune system, fast metabolism, elastic skin, and thick hair are other positive side effects of taking cold showers. If your aim is to relax the muscles, relieve headaches, reduce swelling, fight anxiety, clear the sinuses, or detoxify the skin, a hot shower is just the thing for you. You can read more about the benefits of hot and cold shower in our article. How much money does a low flow showerhead save per year? Low flow showerheads are an excellent solution not just for ecologically aware people but also for those who want to save some money. 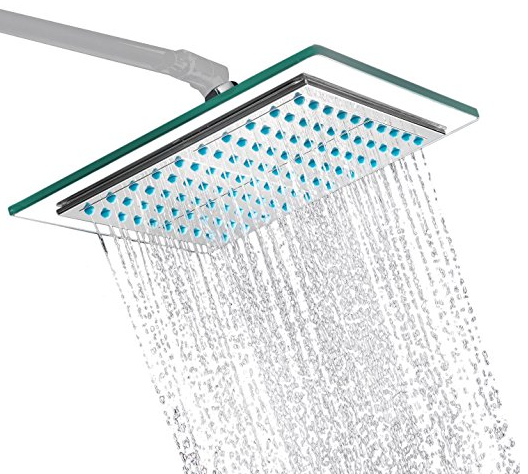 If you take a ten-minute shower each day with a standard 3.5-GPM showerhead, you will spend 12,775 gallons per year. If your shower has more than one user, then that number should be multiplied by the number of users. If you use a showerhead that uses 2 gallons of water per minute, you will waste 7,300 gallons of water per one user per year. If your showerhead has an even lower water flow rate, the amount of water spent will be even less. Meaning, the lower the water flow, the more money saved on water bills. You can also save on electricity. The less water, the less electricity is spent on heating it up. Are plants a good idea in the bathroom? Many people think that the bathroom is not a good place for plants with its high humidity and the lack of sunlight. However, that is not so. Actually, plants in the bathroom are a great idea. They can freshen up the atmosphere, enliven the décor, and, most importantly, deodorize and sanitize the air. You just need to choose flowers that will feel good in the humid and dark bathroom environment. These are tropical flowers that flourish in dark and wet forests. Check out or article on the best plants for bathroom to find the perfect match. What are the best colors when it comes to bathroom décor? When it comes to bathroom remodeling, choosing the right color for walls and floor is one of the main decisions. To be honest, any color can be appropriate in the right surrounding. Light, neutral, pastel colors are considered classical when it comes to the bathroom. However, dark colors are also often used in bathroom décor. Bright colors are common, too. You can learn more about best bathroom colors in our article. How to add storage space to a small bathroom? Finding storage space in a tiny bathroom is not an easy task. Thankfully, there are a lot of products that can help you with that. An over-the-toilet bathroom storage is a perfect solution as it can be installed above your porcelain throne without any space loss. Shower caddies are another great option as they are placed in the shower enclosure. Medicine cabinets do not take up too much space, either, yet they can hold a lot of bathroom necessities. You can even consider installing a small corner bathroom vanity. Shower door or shower curtain – what to choose? If you have a doorless shower enclosure or a shower/tub combo, sooner or later, you will realize that splashes all over the bathroom are not very nice. That is when you’ll have to choose if it is better to install a shower door or simply hang a shower curtain on a rod. The simple truth is, if you have a doorless shower enclosure, a sliding glass shower door will be the best solution, and if you have a tub/shower combo, a shower curtain will do just fine. Shower gel or body wash? Most people wonder: what is the difference between a shower gel and a body wash? These two products are rather similar. However, there are some basic differences between the two. Their consistency is different – gel-like for shower gels and watery for body washes. Their formulae are also somewhat different. Shower gels usually have a stronger concentration and more harmful components. That is why, if you want a gentle product for showering, you should choose a body wash. You can choose the best body wash with the help of our reviews. How to make a bath more pleasurable? Taking a hot bath is a great pleasure in itself. However, there are products that can make bathing even more enjoyable. Best bath bombs can add color and scent to your bath. Bubble bath products will fill your bath with a thick and bubbly lather that is lighter than air and feels great on your skin. Bath oils and bath salts can offer multiple health benefits and improve your general health. How to make the bathroom a safer place for people with mobility issues? According to CDC , most falls occur in the bathroom. That is why safety is the first priority when it comes to the bathroom. Thankfully, there are a many products that can help you with that. Walk-in tubs allow elderly and disabled people get in and out of the bathtub easily. Bath and shower chairs is a great option for those who do not want to install a walk-in bathtub. They can support you while transitioning into your bathtub. Non-slip bath and shower mat prevent you from slipping when showering or getting in and out of the bathtub. Best bath and shower grab bars offer support when you stand showering, as well as when you get in and out of the bathtub. Which is better – loofah or sponge? Taking a bath or shower, we use a lot of accessories. Sponges and loofahs are some of them. Not sure, which to choose. Both loofahs and sponges are great for lathering and exfoliating. Loofahs will be the best choice for those who are looking for a green option. They are made of a renewable plant. Natural sponges, on the other hand, are not as eco-friendly as they are living beings. However, there are sponges made of synthetic materials, such as polyester. They are rather stylish and come in different colors. What toilet flushing system is the most efficient? If you are looking for a toilet, you probably already know that there are several flushing systems. Four of them – gravity flush, pressure assisted, double cyclone, and dual flush – are the most efficient. However, each of the flushing systems have their pros and cons. Check out our article to find out more about each of them and choose the best flushing toilet. Bidet or toilet paper – which is healthier? Toilet paper is the standard choice in most civilized countries when it comes to toilet hygiene. That is rather strange, as bidets are much more convenient and healthy. Using toilet paper might cause different health issues, hemorrhoids included. Washing is much gentler and more hygienic. Not to mention all the trees that are cut each year to produce toilet paper.